Tracing Google logo history is no less than an exciting expedition. Ever since its birth almost 20 years ago, the colorful logo has always managed to attract eyeballs. A lot of creativity, thoughtfulness and technical detailing spent behind its evolution have contributed towards Google’s unmatched brand value. The iterations and versions throughout the process have never been less than the breaking news in creating curiosity. Interestingly, the simplicity of its design is what makes the iconic logo a much-talked about sensation. Do you know that the earliest logo designed for the search engine was ugly and uninspiring? Who are the talented brains that sculpted the logo to become the most recognizable web entity today? What do the colors used in the logo signify? And of course, how the even more interesting Google Doodles and Favicons surfaced? Here’s everything you need to know about the history of Google logo and believe it! It’s one great story to read. It was in 1997 when Larry Page and Sergey Brin renamed their ambitious web crawler BackRub to Google. And, this MS Word-designed logo debut on the servers of Stanford University. Back then, Google was only a college research project and on its way to becoming the biggest online search revolution. It was a simple Wordart design and who thought it would become a search emblem one day. When Google was officially incorporated as a company in 1998, the existing logo appeared no more appealing. It was then that Sergey Brin used GNU Image Manipulation Program (GIMP) to create the first high point of the Google logo history. Baskerville Bold was the typeface used. As you can see, the colors and geometry of the now-popular logo date back to its first version. GIMP was available as an open-source image editing software and it definitely contributed towards the history in making. Yahoo! was a tough competitor back then and it inspired Google. In 1999, the new logo appeared with an exclamation sign at the end and the comparisons between the two search engines escalated. In addition, the color order was changed, though the typeface was retained. Do you notice the alluring 3D effect integrated to the design? Look how Google has put Yahoo! to death. The year 1999 witnessed multiple variants of the logo. Designer Ruth Kedar got onboard and she came up with several ideas in a single year. The initial typeface was Garamond while Catull soon replaced it to become the logo’s typeface for the next 10-11 years. Finally, Kedar rendered a design that would stay as Google’s face till 2010. Apart from being weightier, the icon boasted simplicity, which indeed garnered a lot of limelight. 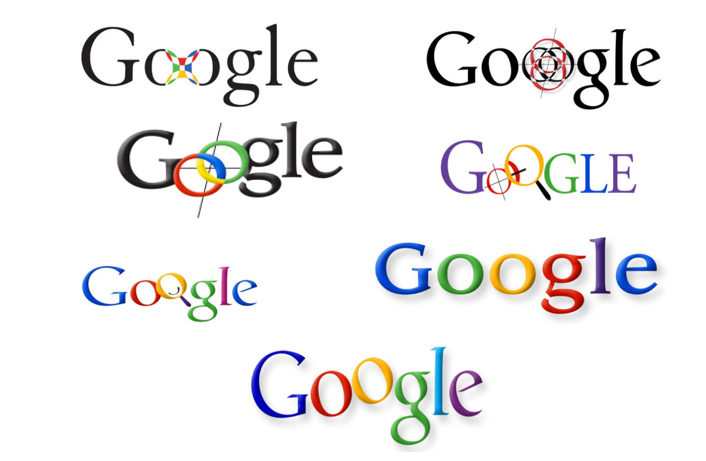 The next twist in the Google logo history came in light in 2010. In a bid to look simpler yet effective, the logo shed the shadowing effect to a large extent. In addition, the colors were brightened up and the result was visually impressive. It was the time when many well-known companies, including Microsoft, preferred to rely on flat colors to create logos. While Google too joined the pack, its complete adoption of the trend would not come before 2013. By the year 2013, internet was experiencing huge presence on all screen sizes. And that demanded from Google to adhere to all scales, without compromising on the looks and already built-up brand equity. Finally, the year saw the logo giving up completely on its three-dimensional structure and going flat. Google always believe in tailoring-up things and its logo is not at all an exception. In 2015, the company created its own custom typeface called Product Sans and gave the logo its brand new look. It is worth mentioning that the similar typeface is present in the logo of Google’s now parent company Alphabet. According to the design team, the typeface takes inspiration from the schoolbook letter printing patterns. An interesting addition, which accompanied the iteration, was the interactive logotype in the form of four bouncing dots. The new logo has a wider reach, better readability across different screens and also the well-recognized panache Google is known for. Throughout the Google logo history, red, yellow and blue have been the dominating colors. These are the primary colors in paint and are the colors of the first 3 letters. Not many know that red, green and blue are the primary colors in light. Hence, these are the colors of the last 3 letters in the logo. The design team also credits Google’s constant bid to break rules as the reason behind painting the ‘l’ in a different color. Another analysis about the logo’s color pattern is also notable. The letters at prime positions 1,2,3 and 5 are painted in 4 different colors. The pattern starts repeating for the letters at composite positions 4 and 6. You must have seen the logo changing colors, patterns and shapes. It happens on the special occasions, including birth anniversaries of eminent personalities and festivals and events. Termed as Doodles, these special alterations were earlier designed as static. Nowadays, these are animated and hyperlinked to the search results related to the person or event featured in the doodle. The first doodle came up in 1998 to commemorate the Burning Man Festival. The shortcut icon or favicon of Google also changed its face many times in the history. The designed ranged from a simple ‘G’ in blue to a lowercase ‘g’ in white to the now-familiar ‘G’ with segments in all 4 prime colors. Google’s logo has kept pace with the changing trends and demands. However, never in the Google logo history, it lost its brand power and continues to go stronger. The timely tweaks endorse the company’s policy to never be afraid of challenging the limits. It is also a lesson on how to cash on uninterrupted branding. Next articleHow Many MB in a GB?